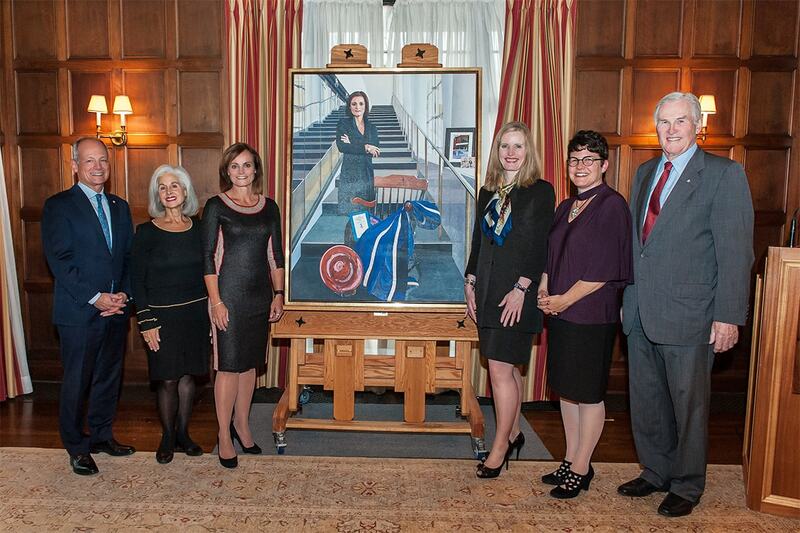 A striking painting of Judy Goldring – named one of the most powerful women in Canada – has been unveiled at the University of Toronto to commemorate her service as chair of the Governing Council. The portrait depicts Goldring on the towering staircase of the building that bears her family name – the Goldring Centre for High Performance Sport. The painting is infused with symbolism that tells the story of Goldring’s life, work and deep connections to U of T.
The portrait was commissioned by U of T for the Governing Council Chamber. “It has been a great honour to serve the university, and I’m really proud of the portrayal of my time at the university through the portrait,” said Goldring, the executive vice-president and chief operating officer of AGF Management Ltd., in an interview. Goldring said she selected artist Linda Kooluris Dobbs to paint the portrait because the artist had previously painted Goldring’s father in 1998. That portrait hangs in a boardroom at AGF Management – the company C. Warren Goldring co-founded in 1957. “I can see his essence and I can see his spirit and his composure in the portrait. I figured if she could do that for him, and I’m looking at this 20 years later, then she could do wondrous things for me,” said Goldring. Working closely together from February to June, Goldring and Kooluris Dobbs came up with a painting that is full of symbols and meaning. Goldring said the artist peppered her with questions and kept exploring ideas through conversations, until the two agreed upon a concept for the portrait. The staircase rising up behind Goldring represents the future, the Goldring Student Centre at U of T's Victoria University is represented by the framed image on the window ledge right behind pictures of Goldring’s children. The glass plate given to her by her brother represents family first, and the silver bracelet Goldring wears bears AGF’s tiger symbol – representing her life and work at AGF. Featured prominently in the portrait is a gown and chair, which Golding says reflects her role as chair of the Governing Council. Under Goldring’s tenure, the University of Toronto Act was amended to allow non-Canadians to sit as Governing Council members, a move she said reflects the university’s significant international population. Goldring received a Bachelor of Arts in economics from U of T, before attending law school at Queen’s University. She was called to the bar in Ontario in 1993. After practising law at Gardiner Roberts and Bennett Jones in Toronto, Goldring joined AGF in 1998. Taking on progressively more responsibility within the firm, Goldring became AGF’s executive vice-president and chief operating officer in 2011. In 2015 Goldring was inducted into Canada’s Top 100 Most Powerful Women Hall of Fame, having been recognized three years previously by the Women’s Executive Network. Goldring said her portrait also has one fun detail that stands out.